The brain, like the rest of our muscles, requires regular exercise to keep it strong and healthy. Unlike our bodies, it can be difficult to know what the most effective ways to train our brain are. For this reason, some people choose to ignore brain exercises, putting them at risk of developing diseases like dementia as they age. In this article, we’ll provide some exercises you can do to keep your brain as fit as your body. The most effective ways of training your brain are by doing problem-solving exercises like crosswords and sudoku. This will force your brain to examine problems from multiple angles. They also improve your ability to look at a problem logically. They may also be able to improve the speed at which you can think and communicate your ideas. Studies also suggest that crosswords might be able to help improve memory as we age. Some patients with dementia had an increase in their mental functioning after starting to solve crossword puzzles regularly. Another essential way to exercise your brain is to read often. This will not only increase your knowledge base, but it will also expose you to a variety of new phrases, expanding your vocabulary. Additionally, when reading you will be presented with a wide range of new ideas to consider. By considering the possibility of these ideas, you will improve your ability to visualize scenarios. You should also to try to experience new things. For example, taking a cooking class can be a great way of meeting new people and trying new flavors. Cooking also involves using several sections of the brain as you smell, taste and touch the ingredients. You could also try to learn a foreign language. Learning helps us keep our minds engaged. Furthermore, studies show that having a large vocabulary places you at lower risk of mental decline. Finally, learning a new sport might be a great way to train both your body and your mind. Sports help us refine our hand-eye coordination skills. In addition, you will have to learn a new set of rules and strategies. Finally, there are a few exercises that you can do to improve your memorization skills. For example, you can travel to a new area and drive around. Then you can try to draw a map from memory. Make the map as detailed as possible, try to remember the streets you drove down, what the streets were called and how long they were. Another memory task is to create a list. Then, after a few hours have elapsed, try to remember the items on the list. The brain is a complex muscle, like all the other muscles it requires regular workouts to make sure it becomes as strong as possible. As we’ve discussed, there are multiple ways of doing this. By performing these exercises, you will be strengthening your mind, which is essential to protect you from diseases such as dementia as you grow older. So, use these techniques to give your brain a workout today. Adding an all-natural supplement and vitamin blend to your diet is also a great way to keep your brain healthy. 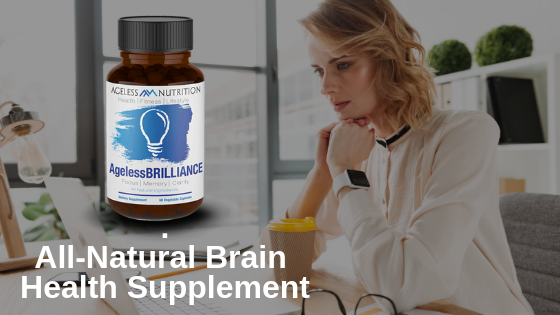 A supplement such as AgelessBRILLIANCE supports mental clarity, focus, and cognitive health while using all-natural ingredients.